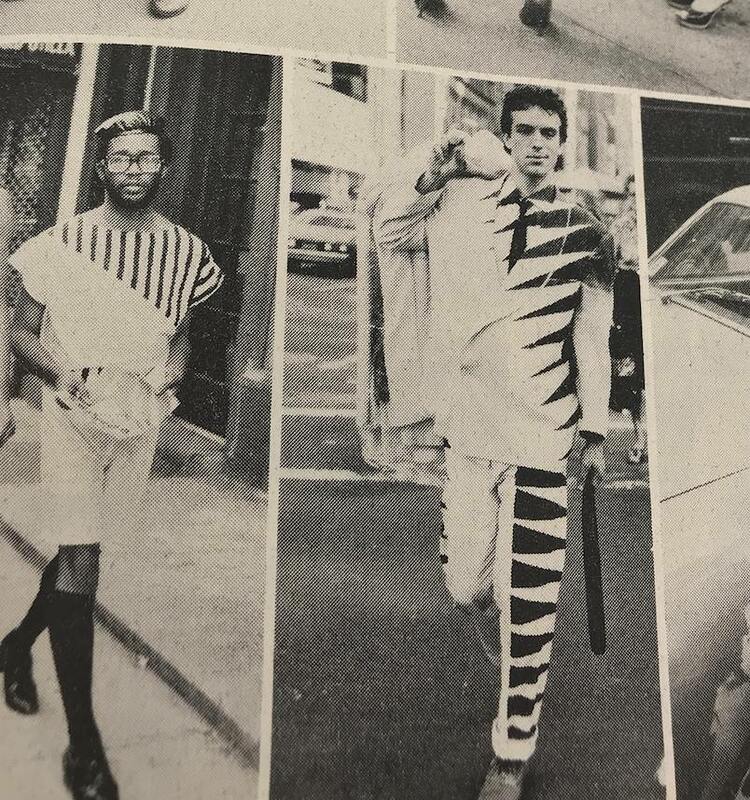 For my artifact post, I decided to examine Details magazine and how the publication presented the culture around street fashion as well as New York nightlife. Throughout the history of its publication, Details focused on fashion, style, and culture, but at times also tackled political and social matters. Through these magazines, the impact of various trends and movements in New York City can be traced. Additionally, the way nightlife evolved is displayed through creative advertisements. Upon looking through various issues from the 1980s, I found the earlier issues from 1982 the most interesting to study. The later issues became more generalized, presumably trying to appeal to a larger audience. The specific artifact I am looking at is Volume 1, issue 3, which was published in the summer of 1982. The magazine displays the ways that fashion, queer culture, and nightlife intersected during this time. It desires to show a sort of unfiltered side of New York culture, while maintaining a sense of glamour. The advertisements included did not necessarily just sell products but a lifestyle and experience. One of the first things that caught my eye in the issue was an advertisement for an event at Danceteria. This small black rectangle advertises a fashion show and auction at Danceteria with bold fonts. During this time, Danceteria functioned as an influential unlicensed four-floor nightclub. Of all places, this was the place to be seen. The club catered to a diverse after-hours crowd. The event at Danceteria was advertised by listing a series of designers and artists who would be in attendance. Additionally, it listed unusual but exciting experiences for auction. This included astrological consultations, days of beauty, flamenco lessons, and massages. Places like these presented the world of nightlife as a form of self expression. People could be their true selves in these spaces and leave the struggles of the outside world behind them for a night. The auction items in the advertisement additionally speak to people’s thirst for an experience. As I continue to flip through the magazine, I come across a piece titled “I won’t Dance, Don’t Make Me.” The narrator’s method of storytelling brings the reader further into the life of the Manhattan clubgoer. The writer, Mick Farren, discusses how the standard for dancing has become stale and unoriginal. Despite being considered one of the best decades for music and dance, he seemed to question nightlife behavior. He seemed to think that a lack of innovation in dance is partially due to a lack of style icons who people would look at to develop an idea for their own club going persona. He goes on to say that people had stopped trying — as nightlife became a status-seeking activity, dancing became less inventive. He believed that dance wasn’t considered as a means of expression or personality in the way that it used to. He describes how these experiences had become too serious, and that people needed to let down their walls again. What he is describing has only become more magnified today, as people often care about the appearances of an experience more than the actual activity itself. The magazine additionally celebrates Downtown street style through photography. It features shots by Bill Cunningham for a section called “Street Seen” which analyses trends as well as the climate of fashion within New York. During this time, fashion was experiencing a shift. It had previously been an outlet only for wealthy and leisured members of society. In the 80s, styles became more subdued and used more durable fabrics that required less upkeep. The elevated but straightforward style of this time can be seen in the floral prints, suspenders, and dramatically shaped sunglasses featured in the section. The piece discusses the change in style once again — he states that this summer is abandoning costumey looks from the previous year and using effortless silhouettes with “ice cream colorings and geometric forms.” He speaks to color trends, one of which is harshly contrasted black and white. He displays photographs of fashionistas who have coordinated perfectly with their dog. This part of the article displays a sense of precision in fashion but also a sense of humor. Another article discusses the reasons why certain artists create the way they do. It looks at a variety of factors which are thought-provoking for the reader. Reflecting on this myself, artists who are sensitive to their surroundings and aware of the modern world are often influenced in ways they may not recognize. Artists are additionally influenced by other artists and their predecessors. Art has become a tool that is used additionally in response to social or political issues. “1980s Fashion: Styles, Trends & History.” RetroWaste, May 2015. Ewart, Asia. “Danceteria (1979-1986).” NY Daily News, 5 July 2017.